Aminoadipate reductase (Lys2) is a fungal-specific protein. This enzyme contains an adenylating domain. A similar primary structure can be found in some bacterial antibiotic/peptide synthetases. In this study, we aimed to determine which bacterial adenylating domain is most closely related to Lys2. In addition, we analyzed the substitution rate of the adenylating domain-encoding region. Some bacterial proteins contain more than two similar sequences to that of the adenylating domain of Lys2. We compared 67 amino acid sequences from 37 bacterial and 10 fungal proteins. Phylogenetic trees revealed that the lys2 genes are monophyletic; on the other hand, bacterial antibiotic/peptide synthase genes were not found to be monophyletic. Comparative phylogenetic studies among closely related fungal lys2 genes showed that the rate of insertion/deletion in these genes was lower and the nucleotide substitution rate was higher than that in the internal transcribed spacer (ITS) regions. The lys2 gene is one of the most useful tools for revealing the phylogenetic relationships among fungi, due to its low insertion/deletion rate and its high substitution rate. Lys2 is most closely related to certain bacterial antibiotic/peptide synthetases, but a common ancestor of Lys2 and these synthetases evolutionarily branched off in the distant past. Not only fungi, but also certain prokaryotes synthesize lysine through the 2-aminoadipate pathway [1–3]. However, the prokaryotic pathway is not identical to that of fungi. The fungal process required to synthesize lysine from 2-aminoadipate differs from that of prokaryotes . The first step of this fungal-specific pathway is the reduction of 2-aminoadipate. Aminoadipate reductase converts 2-aminoadipate to 2-aminoadipate 6-semialdehyde via an adenosylated derivative. In Saccharomyces cerevisiae, this reaction requires Mg2+ and the participation of the products of two genes, lys2 and lys5 . Recently, it has been shown that aminoadipate reductase is encoded by only lys2, and that the Lys5 protein appears to be a specific phosphopantetheinyl transferase for Lys2, converting the inactive apo-Lys2 to the active holo-Lys2 [6, 7]. The lys2 gene is a fungal-specific gene and generally appears to be present in a single copy in the genome. The Lys2 protein has no extensive homologous protein in eukaryotes, with the exception of fungi, but it does possess similarity to some bacterial antibiotic/peptide synthetases [4, 8–10]. Recently, Drosophila and mouse were found to have the analogue of Lys2, which function under degradation of lysine . However, Lys2 is more similar bacterial antibiotic/peptide synthetases than the animal proteins. Lys2 has an adenylating, a peptidyl carrier, and a reductive domain. This protein has twelve conserved motifs. The adenylating domain contains nine conserved motifs . In this study, we aimed to reveal which bacterial adenylating domain is the most closely related to Lys2. In addition, in order to determine the substitution rate of lys2, we compared the lys2 sequences from closely related fungi. In this study, we sequenced lys2 fragments  and compared them among black-koji molds of the Aspergillus niger group. The deduced amino acid sequences (each 343 amino-acids long) from Aspergillus awamori IAM 2112, A. awamori IAM 2299, A. awamori IAM 2300, A. saitoi IAM 2210, A. saitoi IAM 2215, A. saitoi IAM 14608, A. saitoi var. kagoshimaensis IAM 2190, and A. saitoi var. kagoshimaensis IAM 2191 were identical. Those from A. usamii IAM 2185 and IAM 2186 differed from the other black-koji molds by one amino acid. 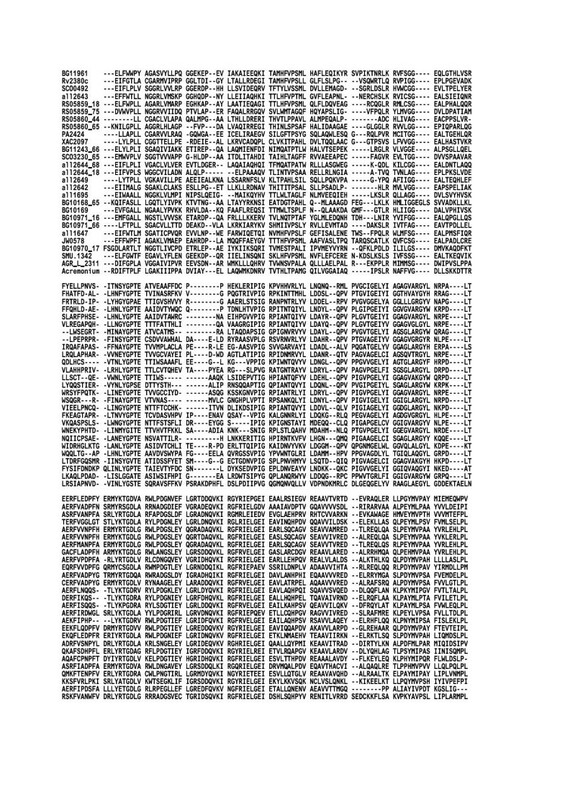 The nucleotide sequences from A. awamori IAM 2112, IAM 2299, and IAM 2300 were identical. Those from A. saitoi IAM 2210 and IAM 2215 were identical. Those from A. saitoi var. kagoshimaensis IAM 2190 and IAM 2191 were identical. Those from A. usamii IAM 2185 and IAM 2186 were identical. Aspergillus awamori's sequence was 10 nucleotides different from that of A. saitoi IAM 2210 and IAM 2215, and 40 nucleotides different from that of A. usamii. We deposited the sequences in the DNA Data Bank of Japan under accession numbers AB079758, AB085587, AB079759, AB085588, AB085589, AB079760, AB085590, AB079761, and AB085591 for A. awamori IAM 2299, A. awamori IAM 2300, A. saitoi IAM 2210, A. saitoi IAM 2215, A. saitoi IAM 14608, A. saitoi var. kagoshimaensis IAM 2190, A. saitoi var. kagoshimaensis IAM 2191, A. usamii IAM 2185, and A. usamii IAM 2186, respectively. Comparisons between A. awamori and Penicillium chrysogenum (Table 1) and between A. awamori and A. fumigatus (Table 2) showed that the rate of insertion/deletion in lys2 was lower and the nucleotide substitution rate was higher than that in ITS regions. We therefore believe that lys2 is a more powerful tool to reveal phylogenetic relationships among fungi than are the ITS regions. The result of the homology search using BLAST showed that Lys2 had a more similar sequence to that of certain bacterial antibiotic/peptide synthetases than did any other existing proteins. In addition, some bacterial antibiotic/peptide synthetases were shown to contain more than two homologous regions. For example, RS05859 in Ralstonia solanacearum GMI1000 has five homologous regions. Therefore, we obtained 57 amino acid sequences, with a value of E < 10-25, from 39 proteins (see Materials and Methods). The phylogenetic tree (Fig. 1ab) shows that the adenylating domains from some bacterial antibiotic/peptide synthetases are distributed quite widely, and that duplications and/or horizontal transfers occurred many times. For example, Anabaena sp. PCC 7120 has 12 similar sequences within itself. In this tree, these 12 sequences were distributed among at least 6 groups. The present findings indicate that duplication and/or horizontal transfer occurred in the genome of Anabaena sp. PCC 7120. On the other hand, the adenylating domains from Lys2 formed a monophyletic cluster. 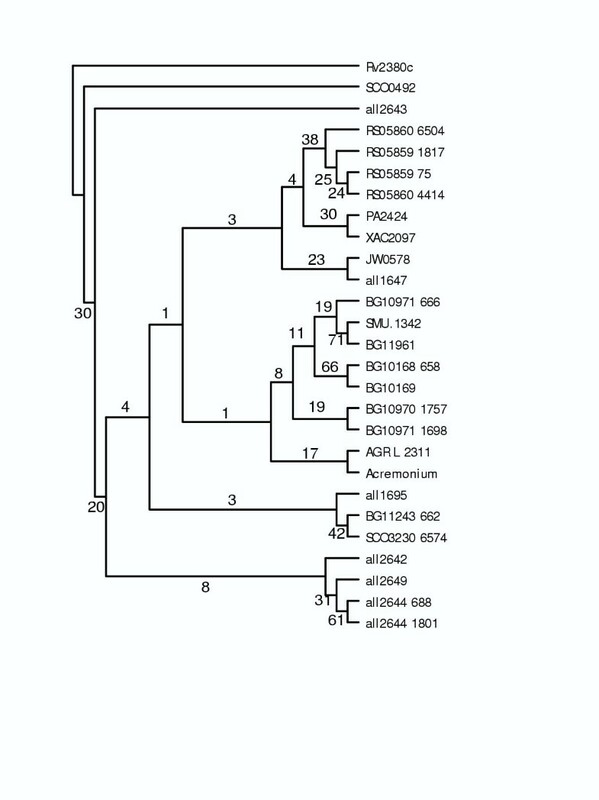 However, the neighbor-joining tree presented here did not clarify which bacterial domain was most closely related to that of Lys2. a) Phylogenetic relationships among 67 amino acid sequences from the adenylating domain of Lys2 and bacterial antibiotic/peptide synthetase. A total of 176 amino acid sites were considered without gap regions in alignment. b) The bootstrap consensus tree. The cut-off value for consensus was 50%. Protein names were shown in Materials and Methods. In order to determine which bacterial domain was most closely related to that of Lys2, a maximum likelihood analysis using PHYLIP version 3.6  was carried out. We selected 27 amino acid sequences from the 67 sequences used in the neighbor-joining analysis. The alignment used in maximum likelihood analysis is shown in Fig. 2. The phylogenetic tree (Fig. 3) indicates that a protein (AGR L 2311) from Agrobacterium tumefaciens is most closely related to a common ancestor of Lys2, but this result had only weak bootstrap support (17%). In the bootstrap consensus tree (Fig. 3), the branch points at the early stage of evolution are very weak support. Animals and plants have no Lys2. If the common ancestor of eukaryotes had a similar protein, the other eukaryotes except for fungi had lost it. Alignment of the selected 27 amino acid sequences. This alignment was used in the maximum likelihood analysis. Protein names were shown in Materials and Methods. The bootstrap consensus tree among the selected 27 amino acid sequences based on the maximum likelihood analysis. The JTT model was used as the model of amino acid substitution. Number of times of bootstrap replicates was 100. Number of times to jumble in the proml program was 5. Protein names were shown in Materials and Methods. This study indicated that Lys2 is more closely related to certain bacterial antibiotic/peptide synthetases than it is to any other known proteins. However, in the distant past, a common ancestor of Lys2 branched off from the bacterial antibiotic/peptide synthetase. This study did not find evidence for a direct horizontal transfer (i.e., at least not a recent horizontal transfer) between bacteria and a common ancestor of fungi. The lys2 gene has been inherited during fungal evolution. On the other hand, in the course of bacterial evolution, the duplication and/or horizontal transfer have occurred. In this study, we used Aspergillus awamori IAM 2299, A. awamori IAM 2300, A. saitoi IAM 2210, A. saitoi IAM 2215, A. saitoi IAM 14608, A. saitoi var. kagoshimaensis IAM 2190, A. saitoi var. kagoshimaensis IAM 2191, A. usamii IAM 2185, and A. usamii IAM 2186. Potato dextrose agar was used for the cultivation. Genomic DNA isolation, DNA amplification, and the sequencing of lys2 fragments were performed according to the method of An et al. .
We compared the nuclear small subunit rRNA genes (18S rDNAs), ITS1 regions, ITS2 regions, and lys2 genes between A. awamori and Penicillium chrysogenum and between A. awamori and A. fumigatus. The following nucleotide-sequence accession numbers were used: D63695, A. awamori 18S rDNA ; U03518, A. awamori ITS1 ; U03519, A. awamori ITS2 ; AB076077, A. awamori lys2 ; M55628, P. chrysogenum 18S rDNA; AJ270768, P. chrysogenum ITS1 and ITS2 ; Y13967, P. chrysogenum lys2 ; AB008401, A. fumigatus 18S rDNA ; AF455542, A. fumigatus ITS1 and ITS2. The preliminary sequence of lys2 was obtained from The Institute for Genomic Research website at http://www.tigr.org. We performed a homology search using BLAST  with the parameter values given in the Kyoto Encyclopedia of Genes and Genomes . The query amino acid sequence was a fragment of Saitoella complicata Lys2 . In this study, we phylogenetically analyzed 57 amino acid sequences (all sequences had a value of E < 10-25, according to the BLAST search results) separately from those of fungi. Multiple alignment was created using CLUSTAL W  among the 57 high-scoring sequences and those of 10 fungal Lys2 proteins. 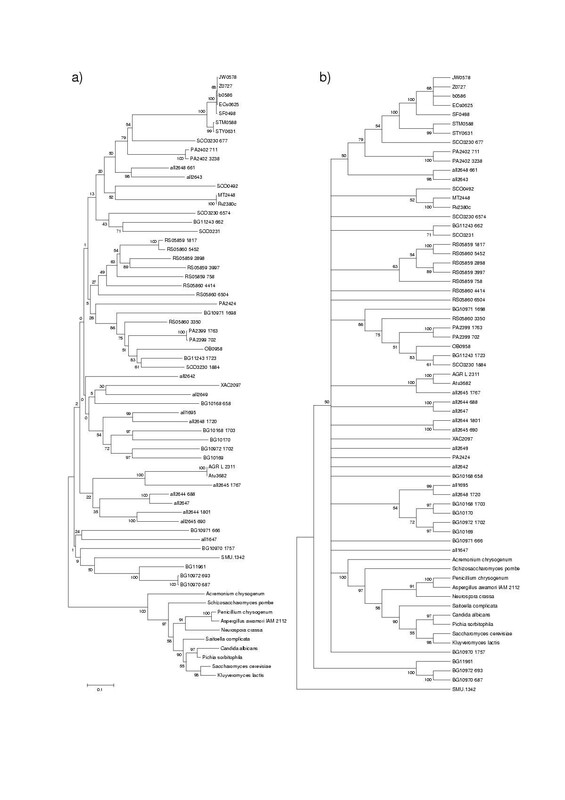 A neighbor-joining phylogenetic tree was constructed using MEGA version 2.1  with 1,000 bootstrap replicates. Based on this tree, we selected 27 amino acid sequences for a maximum likelihood analysis, which was performed using PHYLIP version 3.6 . We used three programs (consense, proml, and seqboot) for constructing phylogenetic tree with 100 bootstrap replicates. The protein names used in this study are AGR_L_2311, Agrobacterium tumefaciens C58 (Cereon) AGR_L_2311; all1647, Anabaena sp. PCC 7120 peptide synthetase; all2642, Anabaena sp. PCC 7120 multifunctional peptide synthetase; all2643, Anabaena sp. PCC 7120 microcystin synthetase B; all2644, Anabaena sp. PCC 7120 peptide synthetase; all2645, Anabaena sp. PCC 7120 peptide synthetase; all2647, Anabaena sp. PCC 7120 microcystin synthetase B; all2648, Anabaena sp. PCC 7120 peptide synthetase; all2649, Anabaena sp. PCC 7120 probable non-ribosomal peptide synthetase; all1695, Anabaena sp. PCC 7120 probable peptide synthetase; Atu3682, Agrobacterium tumefaciens C58 (U.Washington/Dupont) non-ribosomal peptide synthetase; b0586, Escherichia coli K-12 MG1655 enterobactin synthetase component F; BG10168, Bacillus subtilis 168 surfactin synthetase subunit 1; BG10169, Bacillus subtilis 168 surfactin synthetase subunit 2; BG10170, Bacillus subtilis 168 surfactin synthetase subunit 3; BG10970, Bacillus subtilis 168 peptide synthetase; BG10971, Bacillus subtilis 168 peptide synthetase; BG10972, Bacillus subtilis 168 peptide synthetase; BG11243, Bacillus subtilis 168 probable non-ribosomal peptide synthetase; BG11961, Bacillus subtilis 168 peptide synthetase; ECs0625, Escherichia coli O157:H7 Sakai enterobactin synthetase component EntF; JW0578, Escherichia coli K-12 W3110 Enterochelin synthetase component F; MT2448, Mycobacterium tuberculosis CDC1551 peptide synthetase; OB0958, Oceanobacillus iheyensis HTE831 monomodular nonribosomal peptide synthetase; PA2399, Pseudomonas aeruginosa PA01 pyoverdine synthetase D; PA2402, Pseudomonas aeruginosa PA01 probable non-ribosomal peptide synthetase; PA2424, Pseudomonas aeruginosa PA01 probable non-ribosomal peptide synthetase; RS05859, Ralstonia solanacearum GMI1000 probable peptide synthetase protein; RS05860, Ralstonia solanacearum GMI1000 probable peptide synthetase protein; Rv2380c, Mycobacterium tuberculosis H37Rv mbtE; SCO0492, Streptomyces coelicolor A3(2) putative peptide synthetase; SCO3230, Streptomyces coelicolor A3(2) CDA peptide synthetase I; SCO3231, Streptomyces coelicolor A3(2) CDA peptide synthetase II; SF0498, Shigella flexneri 301 (serotype 2a) ATP-dependent serine activating enzyme; SMU.1342, Streptococcus mutans UA159 (serotype C) putative bacitracin synthetase 1; STM0588, Salmonella typhimurium LT2 enterobactin synthetase, component F (nonribosomal peptide synthetase); STY0631, Salmonella typhi enterobactin synthetase component F; XAC2097, Xanthomonas axonopodis pv. citri 306 ATP-dependent serine activating enzyme; Z0727, Escherichia coli O157:H7 EDL933 enterobactin synthetase component F.